Rope & Belt therapy is pioneered by Yogacharya BKS Iyengar Guruji way back in 1970. Dr. S. V. Karandikar, an ardent disciple of Guruji further developed it. Being an expert clinician & blessed with research mind, he applied his anatomical & physiological acumen for musculo – skeletal disorders. It is used as an adjunct in conservative management of Osteoarthritis of Knee Joint, Lumbar & Cervical Spondylosis. Eminent Orthopaedic Surgeon, Padmashree Dr. S. M. Hardikar Sir approves and advises it for selective cases. Stretching of selective skeletal muscles. Restoration of alignment of bones. Correction of weight bearing axis of body. Passive Correction of Pelvic & Shoulder Girdles. To be given by experienced Yogatherapist at Yoga Center. To be learnt by patient & used in day to day life. Rope and Belt Therapy is a valuable application in modern Yogic Science. The classical Yogic postures form its’ base. The patients with history of pain & muscular spasm, are unable to perform & practice classical Yogic postures. 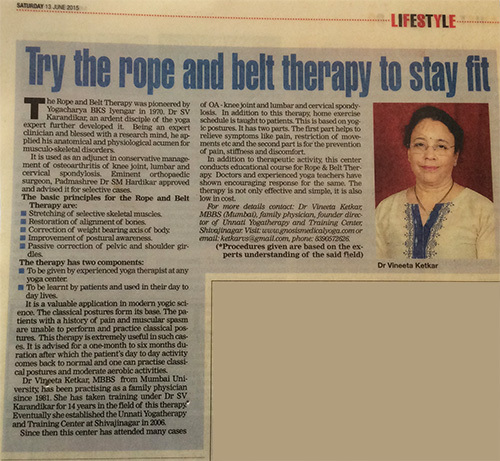 Rope & belt Therapy is extremely useful in such cases. It is advised for one month duration to six months after which the patients’ day to day activity comes back to normal & one can practice classical Yogic postures & moderate aerobic activities. Rope & Belt Therapy is extremity useful for highly motivated, adherent, studious, self care type persons. In case of senior citizens, it requires a support system at family level.